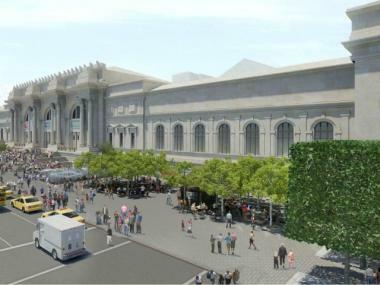 A rendering showing bird's-eye view of the Metropolitan Museum of Art's proposed Fifth Avenue plaza redesign. UPPER EAST SIDE — The Metropolitan Museum of Art’s $60 million plan for a huge public plaza was compared to a common Starbucks at an Upper East Side community board Wednesday. The disparaging comment came just days after the grand plan was criticized at a different meeting for turning the four-block space on Fifth Avenue into a "hangout." The coffee shop remark was made as the full Community Board 8 rejected part of the proposal Wednesday night. Members voted to approve only some of the museum’s renovation proposal before it heads to the Public Design Commission next month — including plans for new lighting, plantings, fountains and, after much debate, a kiosk to sell tickets outside and one for refreshments. But it voted down plans for tables, chairs and red umbrellas to provide some shade. "This spells Starbucks: a place to hang out all day and have coffee," board member Peggy Price said of the seating areas coupled with the Met's planned snack kiosk. "It’s a destination of its own." Many have long been fighting to clear out the food vendors and other street sellers currently near the Met and were outraged that the plan would not remove any vendors, but rather add another one — albeit one run by the museum itself. Several board members didn't think such a plaza belonged in a residential neighborhood — even though the renovation is being funded by one of the Upper East Side's own. David Koch, a billionaire industrialist who lives at 740 Park Ave., is footing the bill. The Met’s director and CEO Thomas Campbell told residents that reconfiguring the plaza and adding the seating areas would help "diffuse" the heavy traffic from the museum's steps, which are often packed with people waiting there, while thousands more try to get in the main entrance at 82nd Street. Also, by moving the fountains to flank the stairs, the path to the less-utilized 81st Street entrance would be opened up, he said. "We're trying to turn this large, barren space into an attractive entrance to the greatest museum in the world," he had said. Many board members remained unconvinced. There was "no guarantee" that the chairs would discourage people from sitting on the steps, board member Michele Birnbaum said. Nor did she think the people occupying the chairs would necessarily be museum visitors. "If you build it, they will come," she said, quoting the Kevin Costner film "Field of Dreams." "This will make it a picnic destination." Several members defended the museum, questioning whether the area on the west side of Fifth Avenue, next to Central Park, was actually a residential neighborhood. "I’m tired of disapproving things because this is a residential area," board member Helene Simon said, noting the plethora of hospitals, schools and other institutions in the area. "We are not somewhere out in Queens or the suburbs." Board member Lori Ann Bores said she believed the museum consulted "the very best" and added, "This is a world-class institution that people all over the world are dying to get into. "I don’t think we are qualified to pick apart these various items." The street furniture was nixed by only one vote (19 to 17). Museum officials were "heartened" by the board's votes on Wednesday and "absolutely intend to keep working with the community to answer any question," spokesman Harold Holzer said. The board's opinion is only advisory. The Met heads to Landmarks Preservation Commission next week and is seeking preliminary approval from the Public Design Commission next month and final approval in early summer. The construction is expected to take 23 months to complete, officials said.